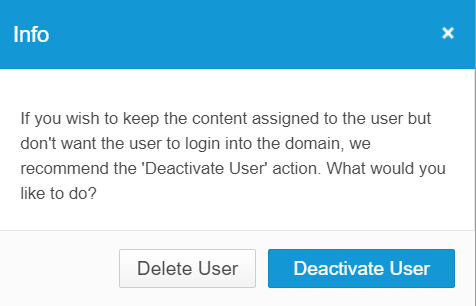 How to Delete Users from Your Mangoapps Domain? /Manage Users & Roles /How to Delete Users from Your Mangoapps Domain? The MangoApps admin may want to delete user completely from the domain to meet the requirement of the company’s security and compliance policy. 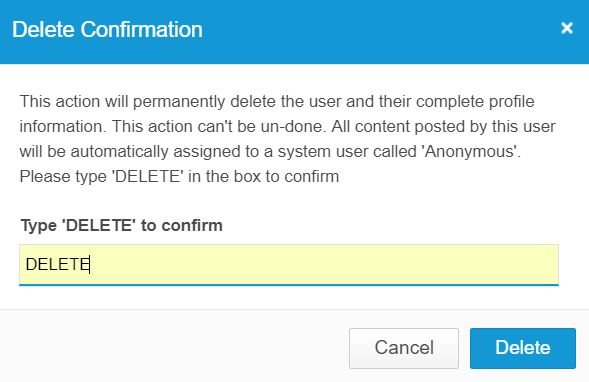 MangoApps provides admin with the feature of permanently deleting a user account from the domain. a. Navigate to the Admin portal. This action will permanently delete the user and their complete profile information. This action can’t be undone. As part of deleting the user & their profile information, the content (e.g., projects, wikis, posts, updates, tasks, ideas etc) posted by the user would be automatically transferred to a system user called “Anonymous”. The user deletion activity gets logged under the Logs > Audit Logs for the admin to refer back in the future. Below is the screenshot of the filter value to search for deleted users in the domain. How Do a Network Admin Invite Users Without an Existing Email Address? How Do Network Admins Edit the Settings for Project/group Creators? How to Give Permission to a Network User to Be Able to Create a Project/group?